According to friends who knew Paul McKnight in school, he was a quiet young man. His parents, John and Martha McKnight, once owned a farm that was east of Clarksville, PA, on land that is now under Shenango Lake. His older sister, Elaine, born with spinal bifida, passed away in her 20s. 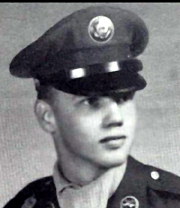 When he graduated from Reynolds High School in 1965, Paul followed a military tradition in his family. Three of his uncles served in World War II – Paul and Robert Yarian, and Eugene Leiphiemer. Two cousins, Dale Jackson Miller and Harold E. Miller, served in Korea. Paul enlisted in the Army on April 24, 1966. In January, 1967, he left for his first tour in Vietnam. He was wounded twice in March, 1967, before he returned to the states, for which he was awarded two Purple Hearts. After a year at Fort Knox, Kentucky, he could have avoided going back to Vietnam because he was the only surviving child. Nevertheless, he chose to go. He was assigned to D Company, 2nd Battalion, 5th Cavalry, 1st Cavalry Division which was conducting intense operations in Tay Ninh Province. In addition to the Bronze Star, Sgt. McKnight was awarded a Good Conduct Medal, National Defense Medal, Combat Infantryman Badge, Vietnamese Service Medal, and an Air Medal. His Presbyterian Church in Fredonia, Pennsylvania, honored him by dedicating its Carillon to him.